Takara celebrated their first anniversary of blythe with a new Blythe model, “Excellent-Blythe.” She featured a body molded very closely to the original Kenner body, but used the same shiny-face/relaxed-eye configuration as the later BLs. With the exception of Cinnamon girl, who was molded in all darker plastics and rubbers, they continued using this combination until Fruit Punch, when they tried a new type of translucent grayish plastic in the eyeballs, as well as new brighter plastics for the eyechips, themselves. Fruit Punch was the “last” regular release EBL. (however, they did release Margaret Meets Ladybug and Samedi Marche long after they stopped regularly producing EBL dolls). in 2003, Takara promised eager fans a major overhaul of Blythe, saying she would be based on precise scans of the original Kenner dolls. Superior Blythe, or SBL, was the doll they delivered. She featured all new facial modeling, including interior architecture, eyeballs, eye mech, chips, and scalp. they continued using the grayish eyeball plastic, but changed the eyeballs to have a similar structure behind the chips as Kenners, and the chips were molded to be smoother on the back, producing a much sparklier eye (see pic). The new scalp set-up involved a 3-piece head design, which was much harder to open than the previous 2-piece construction. Eager customizers found the safest way was to actually cut through the top “dome.” The first three SBLs had issues with their eyemechs that some blythe fans had a difficult time putting up with – their eyes rested in a very downward position after you pulled the string. Takara corrected the problem beginning with SBL-04.Two EBL-faced girls were released in the middle of the SBL-period – Samedi Marche and Margaret Meets Ladybug.Takara has recently begun to follow in customizer’s footsteps, releasing stock SBL dolls with “mods,” such as alternate lip styles, foiled chips, custom chip colors, colored eyelids, custom pullrings, custom skintones, painted nails, and tattoos. 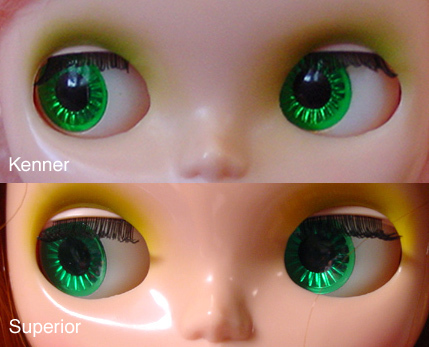 The Radiant Blythe mold was released late 2006.Â Her head is completely different than SBL (see: Radiant and superior technical comparo), so sawing is no longer required to customize (see: Radiant Head opening tutorial).Â Her eye mechanism is mostly the same, with a slightly deeper curvature at the edge of the eyelids being the only difference we have noted, so swapping parts is still possible.Â She has the same Excellent body as SBL and EBL. Darling Diva, Last kiss and Star Dancer are the first three Radiant Blythes. Kenner Blythe is the original doll, produced for a short time in 1972. Concrete details on the production volume and standards of the dolls is vague so speculations and educated guesses are all we really have to go by. She was made in 4 general haircolors; blonde, redhead, dark brunette and auburn brunette. Blondes only seem to have been produced in side-parted hairstyles, but the rest of the colors were produced in sidepart, chunky bangs, and wispy bangs (as well as texture variations) – some combinations are more rare than the rest. There appear to be several mold variations as well as plastic and makeup color variations, with the most common being a very pale pink translucent skin with bold green eyeshadow, pink blush and medium pink lips painted in a sweet smile.Kenner Blythe’s soft rubber scalp is attached via an ingenious system using a cap that clips to her head, meaning she has no glue holding her parts together, with the exception of her eyechips. All the variations of blythe dolls share the same basic mechanical apparatus – a spring-loaded eye mechanism with 4 sets of eye-positions that change when you pull her string, cleverly hidden behind her eyelids. They all have the same basic proportions with subtle differences creating their distinct personalities. 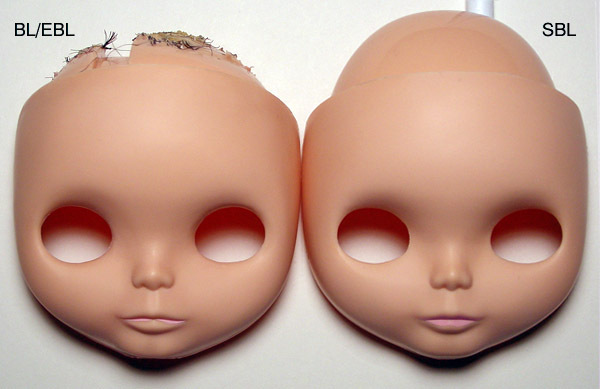 All production Blythes have rooted hair in a rubber scalp. 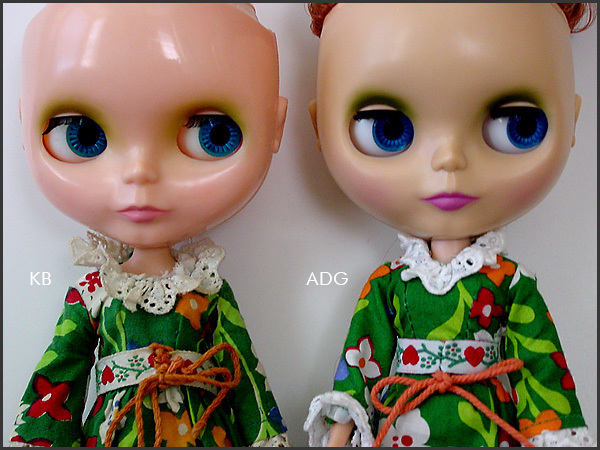 I am new to Blythe with 4 dolls. Marshmallow Yellow, Mandy Cotton Candy, Puchippu Chappu Pepa and I have pre-ordered Neo Blythe Ashleyâ€™s Secret. 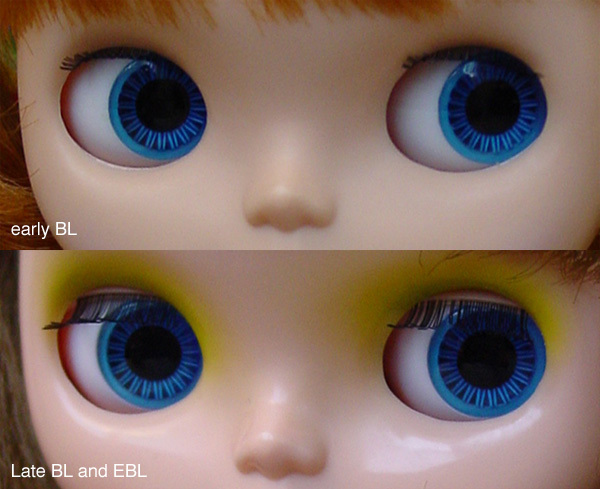 I really want to learn to customize my dolls but I am a little confused over the abbreviations, EBL, RBL, etc. I understand the ones you have described here but what are the newer dolls referred to as? My first task will be to remove the scalp and with your help here I think I can do it!!! But I want to start with a fresh scalp I think. I don’t really want to ruin the original scalp at this point. Thank you for your excellent information!